It happens whenever you visit a new physician, or one you haven't seen in a while: You have to fill out an intimidating, mile-long form with dozens of questions about every illness and chronic medical condition that you and close relatives have had, every time you've been hospitalized, every prescription drug you're taking, and so on. Wouldn't it be great if the doctor could pull the information up without handing you that clipboard? 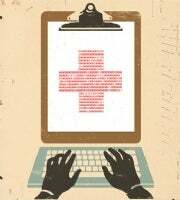 The technology to bring medical records into the digital age is available--you can already start assembling your own medical history on one of several free Web services. These services are unlikely to replace pencil and paper in most doctors' offices anytime soon, but they can be useful memory jogs and aides to third-party caretakers. The largest of these services--Microsoft HealthVault, Google Health, and WebMD Personal Health Record--all offer you accounts with sections for noting your medical history, including chronic conditions, visits to doctors and hospitals, test results, treatments, and prescription drugs. Should you decide to use any of these services, be prepared to spend several hours gathering information and typing it into form fields. All three seem sensitive to people's concerns about privacy, promising account holders full control over their data and who gets it. "We have a really strict set of rules about what can happen to this data," says Sean Nolan, chief architect and general manager for Microsoft's Health Solutions Group, which created HealthVault. "You as a consumer own it." Microsoft appears to be the furthest along in bringing interactivity to its app. In HealthVault you'll find a list of health-care industry participants (insurers, doctors, hospitals, pharmacies) that Microsoft has partnered with for collecting and/or providing data. For example, I was able to download records of drug prescriptions I've filled at Walgreens. Also, a growing number of health-monitoring devices-blood-pressure and glucose-level readers or weight scales, for example-can import readings into HealthVault, which can vastly simplify some tedious record-keeping. Microsoft maintains a list of HealthVault-enabled devices on its site, and a device's packaging will also say if it works with HealthVault. The data can travel both ways: One of the newest destinations for your data is the U.S. Department of Health and Human Services, which lets you import data from HealthVault to fill in the Surgeon General's My Family Health Portrait, an XML-based health genealogy tool. HealthVault includes links to a number of applications that use your data to help you make informed decisions. For example, the free Mayo Clinic Health Manager application will make recommendations based on data you store in HealthVault--say, more frequent cancer screenings based on family history. Again, the HealthVault site maintains a list of apps that use HealthVault to store information. Google Health supports importing health records from a list of sources such as medical centers and pharmacies. It has links to a couple of fee-based services that will convert paper medical records--obtained from you via fax or from your health care providers--into electronic data that you can import into Google Health. Google Health also has links to online health tools (a diabetes risk assessor, for example) and services that will help you find health-care providers. Finally, it gives you access to services that will let you share your medical data, by printing a card to carry with you in case of emergency, for example, or by creating a record that some doctors will take in lieu of a clipboard form. More of a do-it-yourself proposition, WebMD Personal Health Record leaves you on your own for entering data. But filling out the site's lengthy HealthQuotient questionnaire can be a valuable wake-up call for embracing a healthier lifestyle: At the end of the exercise you get a numerical rating for your overall health. You also receive an explanation of how you ranked compared with other users your age, and bar graphs showing your risk levels for serious problems such as stroke and heart attack. Some insurance companies are providing their customers access to patient-centric medical records--histories that present a better picture of a person's health as a whole rather than the traditional claim-by-claim records that focus on specific services in single visits. And some are also starting to offer patients tools to help track the costs of their care, in order to ensure that they are being properly reimbursed and, in some cases, to help set priorities when budgeting is required. One of these tools is the Quicken Health Expense Tracker, which makes it easier to manage medical claims and doctor bills. The Health Expense Tracker helps you figure out what a claim was for (it can look up medical codes and explain them in plain English) and then match it with the appropriate doctor bill, so you can see if you're being charged correctly. In a related development, Intuit has begun marketing an online bill-payment system to physicians, who have been extremely slow to allow patients to settle their bills electronically. Most insurance companies make claim information available online to their customers. But, says Forrester Research analyst Elizabeth Boehm, these records are designed for billing purposes and aren't nearly as good as patient-centric records for help in assessing an individual's overall health. Unfortunately, Boehm adds, very few people (no more than 3 percent of the U.S. population) are taking advantage of online medical-history tools because they're a lot of work-and because doctors don't really trust them anyway. It's a sort of Catch-22: Electronic health records won't be useful until more doctors and hospitals contribute to them, but doctors and hospitals won't contribute to them until they're more useful. Still, even without doctor buy-in, these records can be invaluable in some instances--for example, to other caregivers (such as relatives of the patients)--who may not be familiar with the family history. The transition to electronic record-keeping is getting a boost from the Obama administration's stimulus plan, which includes incentives for physicians who move to electronic medical records. The administration considers the adoption of this technology crucial, as it can help cut costs by eliminating duplication of effort (for example, tests that one doctor performs because he doesn't have the results of the same test performed by another doctor). It will take some time, but systems that allow patients to manage their own health-care information will continue to pick up speed. The clipboard's days are numbered.